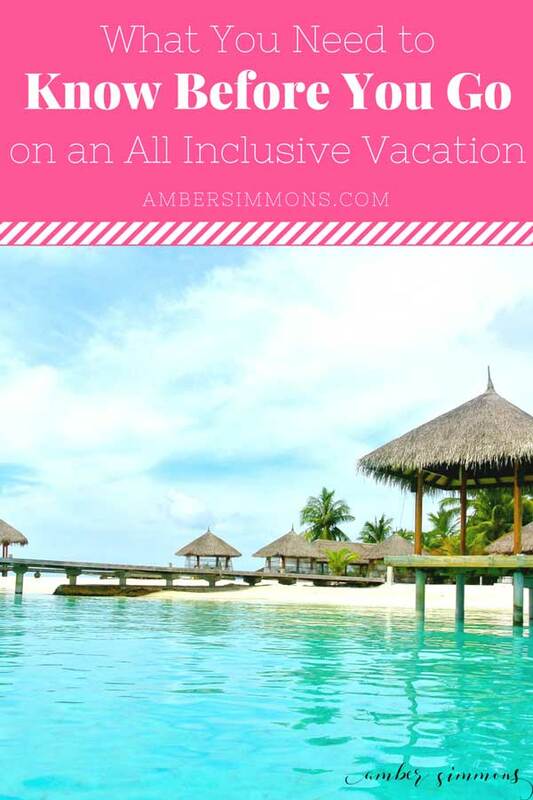 This list of frequently asked questions and tips will help you prepare for what you need to know before you go on an all-inclusive vacation. Typically it means just what it says. Everything is included. So the price of your room might seem a bit higher than staying at a non-all-inclusive resort, but all your food, drinks, transportation to and from the resort, and activities on the resort are included. Now, you will have to check with your resort to see the details, because not 100% of everything is always included. Sometimes you have to pay extra to do certain water activities like night snorkeling, Catamaran cruise, or scuba. Sometimes, depending on your resort and the deal when you booked, you might have a free excursion. Most of the time excursions are extra. Excursions are things like horseback riding, swimming with the dolphins, zip lining, hiking waterfalls, etc. Basically, anything that you’re leaving the resort to go do. If your resort has a spa, those services are not included. If you are planning to get a massage it will be an extra expense. Depending on where in the world you are going to be staying, all-inclusive might mean something different. I have seen several resorts over in the South Pacific area saying they are all inclusive and they mean your room include your breakfast. But it doesn’t include all your food. So just read the fine print on what your resort considers all inclusive. You mention transportation to and from the resort, the resort takes care of that? Most resorts do, yes. In most cases, the all-inclusive resort will have a shuttle to and from the airport for you. Places like Sandals and Couples also have their own little waiting area inside the airport while you wait for the rest of your party if you took different flights or wait until you have more people for the shuttle. They often have a bar where you can get a drink and cushy seating to relax. They also might have a private restroom. When it says the food is included what does that mean? For most all-inclusive resorts it means you can have an unlimited amount of food at any time during your day. A lot of resorts also have food available 24 hours a day, including room service. So what that means so you can breakfast, lunch, dinner, snacks throughout the day, a midnight snack, room service, the works. Couples Negril had a soft serve ice cream machine out for you to get your own ice cream in their grill restaurant. We walked by that several times a day and got ice cream cones several times a day. Don’t feel bad if you order something you don’t like. You don’t have to eat it. You can order something else. I know that sounds wasteful. But you’ve already paid for it. And they offer unlimited food. So might as well. Also if you’re at a restaurant and the portion size is very small or something was absolutely amazing you can ask for seconds. Staff at the resorts are usually very accommodating. Can I have fun at an all-inclusive resort if I don’t drink? Of course! A lot of people there will be drinking since the drinks are included. But if you don’t mind being around drunk people then you could still have a great time. You can sip on virgin piña colada and sodas all day long. They might even have fresh coconuts if you enjoy fresh coconut water. I’ve also had some amazing fresh local juices. When is the best time to travel to an all-inclusive resort? Anytime you can. But a lot of places do have a peak and a low season. The Caribbean, for example, has cheaper prices and fewer people traveling during Hurricane Season. That is June through October. November through May is considered their peak time as the weather is likely to be more agreeable. Is it safe to go to the Caribbean during Hurricane Season? It sure is. You just need to be cautious. Check the weather before you fly. We were all obsessively checking weather.com right before we left for Jamaica. Also, it helps if your resort offers some sort of insurance on your reservation to allow you to cancel or change it based on the weather. There are also several places that see fewer hurricanes than the rest of the Caribbean. Those islands include Barbados, Aruba, Curaçao, Bonaire, Isla de Providencia, Saint Vincent, Grenadines, Grenada, Trinidad and Tobago, San Andrés, and some islands off of Venezuela. Check with your resort and or research the island to get an idea of the weather they are expecting. Can I take my kids to an all-inclusive resort? Absolutely. There are plenty of resorts that are family friendly. Beaches, Nickelodeon, and Coconut Bay to name a few. On the flip side if you don’t want to vacation with children there are plenty of resorts that are adults only. Sandals, Couples, Secrets, and Excellence are a few adults-only resorts. None, on the resort anyway. In most all-inclusive resorts the staff doesn’t accept tips. And all your expenses have already been paid. If you do happen to buy something from the on-site gift shop it can be charged to your room. Same with any paid activities or a visit to the spa. Those can be charged to your room as well. Now if you are leaving the resort, that’s another thing. You will want some cash for tipping drivers, zip line instructors, purchasing things in any shops you visit, etc. So how much cash you need really depends on what you plan on doing. It can look like anything you want. A typical day for us was getting up, going to breakfast, then heading to the ocean to float a little bit. Then we would have lunch and get in the pool. If we were going to do any water activities we typically did then later in the afternoon. Then we would go to our rooms and dress for dinner. After dinner, we would just hang out for a bit and then call it a night. All in all, it was very relaxing. I like not having a schedule of what we’re doing. That’s my kind of vacation. Where I just sit and do nothing. It’s probably because I’m a mom. Any chance I get to sit and do nothing and have no one asked me for anything is amazing. In most resorts bathing suits are not allowed in the restaurants. So as long as you have some sort of swimsuit cover and the guys are wearing shirts with their trunks and everybody has shoes you should be good. At dinner, it is a little bit fancier. You know. Resort Wear. Just sundresses for the girls with sandals. You don’t have to wear dresses. You can totally wear pants or capris as well. The guys usually wear khakis and a button-down. It’s a little bit more formal than the rest of the day but not too much. It is a tropical vacation after all. Check with your resort to make sure what the dress codes are for the restaurants. If you need help knowing what to pack, check out my post on What to Pack for Your Caribbean Vacation (Coming soon!). What else is there to do around the resort? You mean besides the pools and beach? A lot of resorts of activities committees. They plan activities throughout the week such as Minute to Win It and The Newlywed Game. Not everything is a game though. Some things are instructional classes. Like on where coffee comes from or different types of liquor. I’m basing these activities on what was available at Couples Negril. Can I bring stuff back? Sure. Things like alcohol will have to be walked through Customs when you reach the US. Check with the US Customs website to see what you are allowed to bring back. In Jamaica, the sign at the airport said we could bring two bottles of alcohol each. We purchased three. When we reached US Customs we were told that we were allowed to bring two total without a fee. But he let us bring the third as well. So to be safe, go with what the website says, not what the sign in the local airport says. Resorts sometimes offer perks when you are booking such as a free excursion or a spa credit. Be sure to know if you qualify for any of those items so that you can make the most of your vacation. Also, know your resort’s cancellation policy. This is helpful if you need to cancel your trip for any reason, especially weather. Do you have any tips that I didn’t cover? Leave them below!